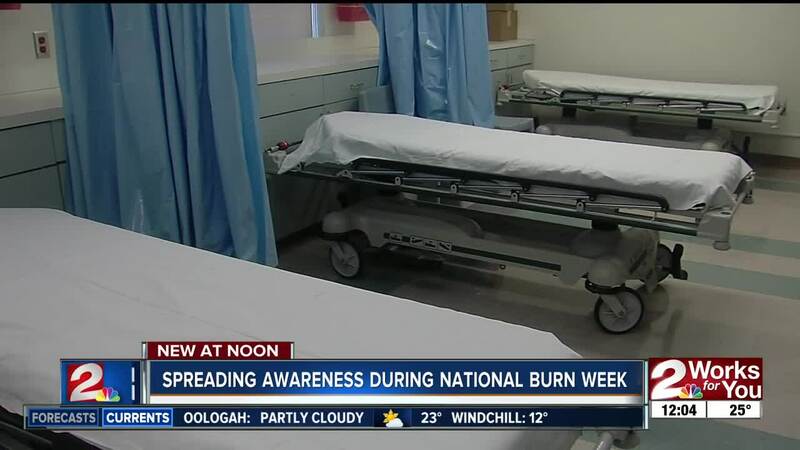 TULSA — The Tulsa Fire Department, The Alexander Burn Unit at Hillcrest and a local burn survivor are raising awareness about National Burn Week. Dr. Tara Wilson, director of Hillcrest's burn unit, said they see 35 to 40 outpatient burn patents every week, plus patients they have to admit. One of them is Abigail Duran. 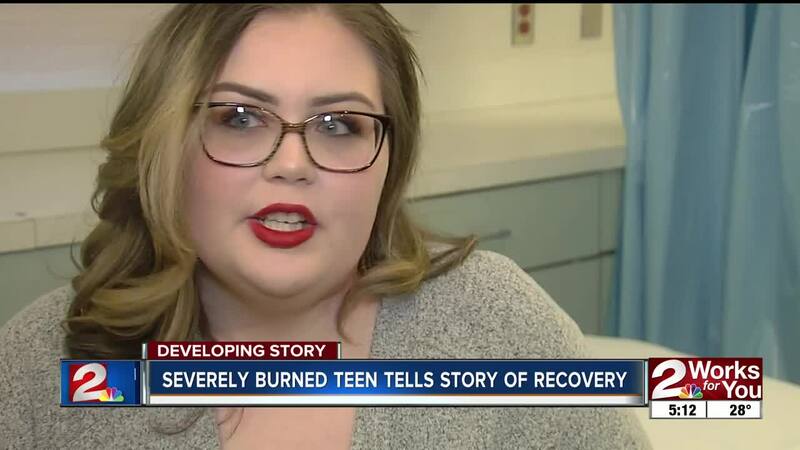 She is 17-years old and a burn victim. Her car was rear-ended on her way to school in November in Stillwell and her gas tank exploded. The teen said her car went up in flames and she was trapped inside. "I screamed, 'God, please help me' and there was a man with a fire extinguisher and he smashed my window in," Duran said. She was taken by helicopter to Hillcrest Hospital. "I was here like seven weeks," Duran said. "They were hard and it's still hard today." About 35-percent of her body was burned, including her left leg, arm, hands and face. She was in a medically induced coma for two weeks, had six surgeries and multiple skin grafts. "I'm really lucky that's all that happened to me, because I was in that car for a good minute," Duran said. The pain was excruciating and came with anxiety. "I didn't want to give up so quick in life," Duran said. "It's rough on the nurses sometimes as much as it is on the patients," Duran's nurse, Wendi Slay, said. "We have to inflict pain, which we don't like." Dr. Tara Wilson who is the director of Hillcrest's burn unit commented on how well Duran recovered as she entered the hospital Friday for a check up. Dr. Wilson and Slay said they see all different types of burns. The emphasis for National Burn Week is on scalds. Statistics show 30-percent of burns are from scalds and they are on the rise. As far as children, Dr. Wilson said she sees scald burns from them working in the kitchen. She said it mainly happens from them pulling things out of the microwave and spilling it on themselves, like hot chocolate, noodles or oatmeal. She said elders are also at risk of scalds, because they do not have quick reflexes and they cannot sense the heat. "We don't like the business, but we take it because that's what we're here for," Slay said. Also, Tulsa Fire spokesman, Andy Little, said people's hot water heater can be turned up too high and scald them. The doctors see it all, even the patients who are not able to make the recovery Duran has. The 17-year old said she still questions why she survived. "I'm just lucky," Duran said. "That's all I can say is I'm just lucky."